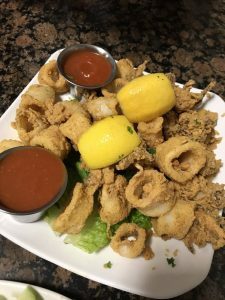 ***** DISH OF THE WEEK (Sunday- 12/17/17- Chris’ Taverna). No bs-here, delicious food- enormous dirt cheap portions- terrific service! ***** DISH OF THE WEEK (Sunday- 9/21/14). Trust Jeff Eats when I tell you that Chris’ gyro wrap is off the chart-it is absolutely delicious. Just so you know, the original Chris’ review (5/21/10) has a different address listed-when Jeff Eats first “tried” Chris’ it was a small hole in the wall, the new location is in the same shopping center and seats a ton of people inside and on an outdoor patio. Without any hesitation, Jeff Eats will tell you, Chris’ Taverna is one of the best Greek restaurants in South Florida. My wife and I tried for the first time this evening and you hit this one out of the park. Delicious reasonably priced lamb chops, stuffed cabbage and gyro. Ate there for the first time last night and the food is amazing. 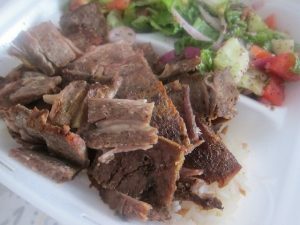 Delicious gyro and lamb chops. Giant portions.